Walk up a few steps from the city sidewalk and hear the sounds of water gently burbling from a natural stone fountain. As you move along the hand-cut flagstone path between lush plantings of Japanese maple, hydrangea, ferns, hosta, wild ginger, fuchsia, and golden grasses, a small patio emerges along with soothing sounds of moving water. Eric and Bev took a few years to think about how best to create a garden like this one: a peaceful and quiet space from which they could enjoy views of Puget Sound and attract hummingbirds, butterflies and bees, while dampening city sounds. The result—a running creek with small waterfalls, the feel of an alpine garden and the sense of privacy, all on a hillside city lot. A lot of time and trial and error was spent in setting elevations and placing stone to make the creek, ponds and waterfalls feel and look natural. The garden has an extensive drip-irrigation system allowing for differing watering requirements of surrounding plantings. Low voltage lighting illuminates the patio, paths, key plantings and each of the waterfalls within the creek. All of the stonework (about 15 tons) was cut on site and placed by Eric and a friend. Clumping bamboo screens the back area of the garden. Low-growing evergreen grass, Acorus gramineus ‘Ogon’, is planted along the stream bed with several varieties of tall grasses, rudbeckias, phormium, echinacea, and bee balm (Monarda didyma ‘Jacob Cline’), especially attractive to hummingbirds. Follow the stream down wide stone steps and pause to look back upstream. Yarrow, lavender, coreopsis and small ground-hugging creepers line the steps. Follow the path around the west side of the house lined with Japanese maples and back to the front garden. 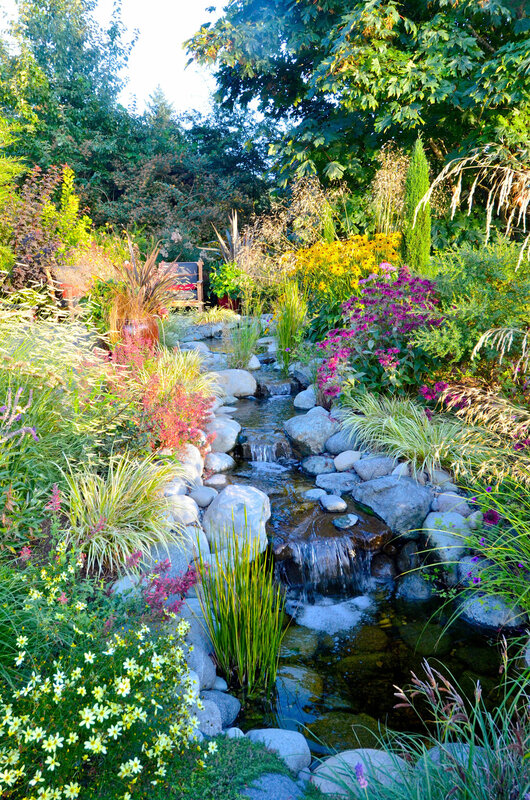 Linger here for a moment and take in a final view of Puget Sound and this beautiful garden.